First impressions: Prior to opening the packaging, I did a bit of research on the manufacturer, which I already knew to be Danish. It was rather a surprise for me to learn that Eltax could be considered one of the elder statesmen of Danish hi-fi, if not in hi-fi in general, having been founded in 1959. Okay, so it has not been around as long as the likes of Ortofon or Bang & Olufsen, but considering it is significantly older than Linn or Rega, one would have thought one would’ve heard of at least of one product of landmark significance from the company. Yet, that is not the case, at least for yours truly, so please pardon my ignorance if indeed there is such a product. This brand’s products were truly an unknown quantity to me prior to my undertaking this review. 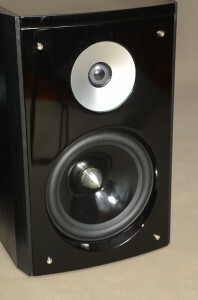 The Shine 4 bookshelf loudspeakers are slightly larger than true miniature bookshelf loudspeakers. 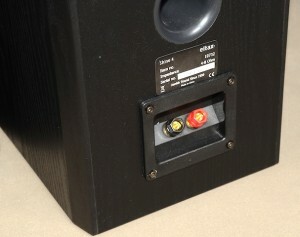 The review sample was almost exclusively black, only the silver-ish “waveguide” around the tweeter and the similarly finished bullet head-shaped phase plug in the middle of the woofer adding some contrasting shiny metallic parts. The sides were of a matt finish with the front baffle and top having a nice glossy shine, one’s fingerprints showing all too obviously if not wiped down after being handled. The slightly curved speaker grilles were magnetically mounted, which was a nice touch. Fitting quality of the cabinets and drivers was not particularly impressive. What looked like small glue stains could be seen on one of the grille’s cloths and at some of the edges of the cabinets. The metallic waveguide didn’t fit as tightly or evenly around the dome unit as I’ve seen elsewhere. To be fair, the overall result wasn’t by any means bad (I’ve seen a lot worse at the price, and more), but as these speakers are being made in China for Eltax, one had hoped it would be better, especially when what’s coming out of the IAG factory in China for that group’s own brands, as an example, and at lower prices for some of their models, can look eminently more plush than here. This only serves to remind us that manufacturers competing in the specialist budget hi-fi market face a cut-throat proposition and there is no quick and easy path that enables one to go laughing all the way to the bank. Specs: The Eltax Shine 4 is a two-way bass reflex design with the port being at the rear. Cabinet size, as previously stated, is larger than that of true miniatures like the Epos ELS3 and Dali Royal Minuet, coming in at 312 x 210 x 250 mm (h/w/d). 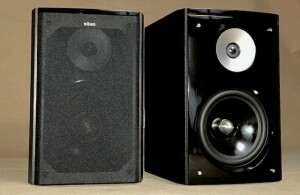 Driver dimensions are 16.5cm for the mid-bass unit and 2.54cm for the tweeter. The manufacturer quotes the frequency range covered to be 60-20k Hertz and the nominal impedance of these loudspeaker to be eight ohms, sensitivity being a healthy 89dB. Recommended amplifier power is in the 20-100W range. Performance: The Eltax Shine 4s proceeded to shine forth (ugh!) upon being substituted for my normal vintage Sonus faber loudspeakers. Balance was significantly more upfront and brighter than the said SFs, so I informed the Editor that I would probably be taking a bit more time with the running-in process of these babies than first thought. The Shine 4s served to provide sleep-accompaniment entertainment for a good part of a month, being fed with mostly classical and relaxing instrumental music from the higher bit-rate internet radio stations that caught my fancy whenever TuneIn Radio on my iPad 3 was accessed (the Linn Classics station being one which saw much “air time”). I soon formed the view that these speakers were not really comfortable being put in the role of near-field listening loudspeakers, the integration of the drivers being better achieved some bit farther out than with some of the competition. Bass was that bit fuller, but not as controlled, as I recall from the standout budget bookshelf loudspeakers I had spent time with recently (I have in mind especially the Wharfedale Diamond 10.2s here). Bass depth was adequate, if not very extended. When played loud, there was evidence of cabinet colouration as the low to upper mids had a beefier feel to them, Surprisingly, this was not necessarily unpleasant, as one person who heard the Shine 4s stated he kind of liked the effect when heard with some enthusiastically-played contemporary piano pieces! I think I got what he was alluding to, even if I did not necessarily agree this was to be viewed as something positive. Midrange was competent without setting any new standards, voices being listenable with good diction heard on lyrics, even if the naturalness factor of a good “BBC sound”-oriented monitor wasn’t quite to be had. Male voices in my view did a little better than female ones, where the slightly bright and forward balance which was perceived did not do thinner recordings of those of the fairer gender any favours. I hope I’ve not gotten too critical by saying this, but the thought “home theatre speaker, albeit a better-than-usual specimen” kept whispering at me. The highs did stand out – although not rough-edged, it did have somewhat of an emphasis to it, perceived as a kind of dominance, hence my preference to sit further away from than I would from some loudspeakers of ostensibly similar ilk. The sharp attack sounded a bit unnatural, the too bell-like effect of what was a triangle being struck just not sounding natural to me. One could argue that I’m perhaps partial to more reticently-balanced speakers like the classic Sonus fabers I regularly use and therefore, bound not to favour such a presentation. I feel this is not so, as I also do have a bright loudspeaker in the form of the Triangle Ikotos in my component collection, but perhaps my reaction is more due to what I perceive to be an uneven dispersion between the upper end and how it segues into the mids and lower frequencies. It would be interesting to see the measured frequency response of the Shine 4s, which alas, I have no means or competency to perform. I did feel less of this dominance toward the end of the review period, perhaps due to more running in, or perhaps my ears were just getting more acclimatised to the overall presentation. Ultimately, I preferred the speakers’ results when playing vinyl than with digital sources. The good: A breezy, upfront and enthusiastic presentation with clear mids and a slightly coloured upper bass that makes for perhaps better enjoyment with modern pop and rock material. Highs are projected out strongly the way some may prefer, but this is where I recommend you spend some time with the Shine 4s before deciding if this aspect of, and indeed their overall presentation is for you. Careful partnering will obviously yield better results. I also suspect stranded cables may have worked better than the solid-core ones I used during the review period. The ungood: A difficult one to sum up. This is not a bad loudspeaker by any sense, just one which perhaps is better suited to more high-octane material where the listener doesn’t mind listening past some of the colourations to enjoy the fair measure of detail and insight projected out at him or her. They seemed to still “work” overall, and if the balance is right for your system, they will entertain even if there is a propensity to be a little forthright. Final verdict: Not a loudspeaker that will set the audiophile world at this market level alight, but one which still performs and has virtues which may excite the kind of listener who finds the average audiophile-oriented bookshelf loudspeaker too restrained and boring. Someone who is looking out for a 2.0 or 2.1 channel music system which also does duty with video sources (or vice versa) might just find the overall package to his liking. Sources: Nameless Chinese-made high-spec’d Android Tablet, Apple iPad 3, Garrard 401-RB300-Rega Exact / Preamps: LS QA550 WAV Reader-Monica 2 DAC, Parasound Halo JC3 / Amp: Euphonic Research ATT600-Amp-80 (Silver rod edition) / Wires: Euphonic Research Axon solid core speaker wires, Zion S2 Audio interconnects. Lim Juan got into hi-fi for the same reason a good many (but not all) of us did – the love of music. He grew up on gear his dad had. His mother used to work in a record shop where dad bought his LPs, so the seeds of addiction were set before he was even born! A lot of guitar-driven rock stuff shaped his tastes, and which he today still remains partial to, even though his palette has always been eclectic. He is now somewhat past the stage where high-end audio’s big brand names and fancy casework cause him to drool (though not completely out of it!). His day job in the corporate rat race keeps him busy and listening time is scarce and available mostly in the late nights only. He has two children, one plays the cello, the other the violin, and he attends MPO concerts at the Dewan Philharmonic ‘somewhat regularly’.